I'm always on the lookout for a new and different scent, one that will make me stand out from the thousands of other women on the planet. (Because as much as I love Angel, once it took off, everyone and their mother started wearing it and that was kind of annoying). 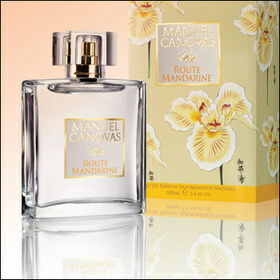 My new fragrance love of the moment is Route Mandarine from Manuel Canovas. It's a warm, spicy scent that sort of draws you in - when I first smelled it, I liked it, but wasn't completely obsessed. But then I found myself coming back to smell my sample again and again. Manuel Canovas created the scent around his fascination with the Orient and it shows. The official description is "Top notes of Egyptian Geranium, Madagascar Clove, and natural Citrics open to a provocative blend of rare Patchouli, Jasmine, Vetiver and oriental woods. The base is a unique and complex mix of White Musk, Madagascar Vanilla and Eastern spices." It's a unique and spicy scent, definitely not a perfume you'll have to worry about sharing with every other person on line with you at the grocery store. Route Mandarine is available at canovasfragrance.com. A 100ml bottle retails for $95.